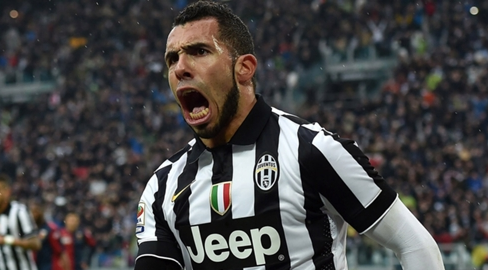 Juventus bounce back from their weekend loss to local rivals Torino as Carlos Tevez’s brace sees them beat Fiorentina. Gonzalo Rodriguez’s missed second half penalty a crucial miss for the Viola.Juventus seal an unconvincing win against Fiorentina in an entertaining game in Turin. The Bianconeri won't win the title tonight thanks to Lazio's victory over Parma, but the celebrations can begin as early as the weekend. Massimiliano Allegri's men could have wrapped up a fourth consecutive Scudetto had they beaten Torino on Sunday,Juventus need only a point to win the Serie A title after Carlos Tevez scored twice in a 3-2 home victory over faltering Fiorentina on Wednesday.